Justice Scalia's daughter arrested for driving under the influence | Jon Katz, P.C. 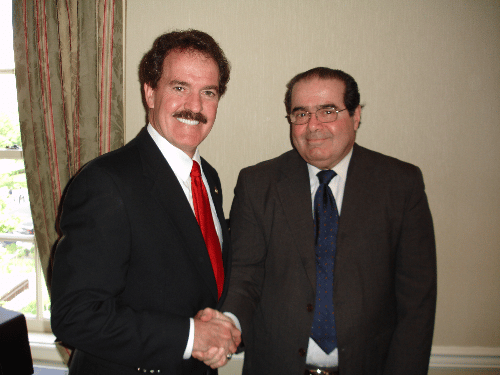 Justice Scalia (r) meets U.S. House member Phil Gingrey (l). (From Phil Gingrey’s Congressional website). Justice Scalia is a curious Supreme Court justice. He is solidly in the court’s conservative four-justice wing that also includes Chief Justice Roberts and Justices Alito and Thomas. On occasion — still too rare in my view — he departs from the law-and-order stereotype and pens a majority opinion or dissent highly favorable to individual liberties, saying the Constitution leads to no other result than the one he has reached. I have written about Justice Scalia here, here, here, here, and here. This week, Justice Scalia’s daughter Ann S. Banaszewski was arrested at or near a McDonald’s for allegedly driving under the influence of alcohol. The drunk driving laws are unfair, at least in that all states that I know of automatically criminalize driving with a blood alcohol content of 0.08 or more, even though a very small amount of alcohol can cause such a reading. Therefore, the drunk driving laws criminalize what should not automatically be criminal, namely a 0.08 blood alcohol content. I write more about drunk driving defense here. The police are not disclosing much information about Ms. Banaszewski’s arrest other than to confirm that she is charged with driving under the influence and child endangerment for having three small children in her van at the time she was stopped. The only silver lining in all this is to make criminal arrests and prosecutions more real — rather than simply abstract — for Justice Scalia and his colleagues. Jon Katz.